I love Usagi Yojimbo. I love the Teenage Mutant Ninja Turtles. When these two anamorphic powerhouses cross paths I love it even more. I love everything in this collection. Yet somehow I don’t think the timing for this collection was right. I think the main reason for that feeling is that the last story in the collection, Namazu has been published three previous times in the past 13 months, with Turtle Soup and Rabbit Stew being included with the last printing. At least the last of those editions didn’t really need to happen. But let’s forget about that, and look at the good things, shall we? 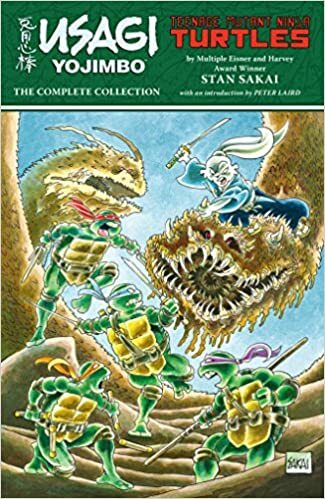 First up is Turtle Soup and Rabbit Stew, the first crossover story from Turtle Soup (Mirage Studios), a 1987 anthology of different artists/writers playing in the TMNT sandbox. In it, Leonardo somehow falls into Usagi’s world and ends up fighting a group of samurai bandits, while Usagi is busy fighting a group of ninja. The two fights end up merging until only Leo and Usagi are left standing. Each thinking the other was part of their attackers they clash, only to have Leo disappear as quickly as he appeared, popping back into his own reality (and into a pile of his brothers). Second is The Crossing. Written and Illustrated by TMNT co-creator Peter Laird, this is one of the rare published stories of Usagi created by someone other than Stan Sakai himself. It first appeared in Usagi Yojimbo vol 1 issue #10 (Fantagraphics Books) in 1988. Laird pens a poignant tale of arrogance and honor. Without going back into my collection of collections (which is currently in storage after a move) I’m not actually positive I’ve read this one. I’m certain I have, but I have no distinct recollection of it. Next up is The Treaty, from Shell Shock (Mirage Studios) in 1989. Leonardo once again, inexplicably, pops out of New York, into ancient Japan, and into the middle Usagi being ambushed. The two battles side-by-side until Leo disappears (no less inexplicably than before) back to NYC. The three-part story, Shades of Green, introduced Usagi Yojimbo to a new publisher with vol2 issues #1-3 (Mirage Studios) in 1993. At a combined 60 pages, this remains the longest crossover to date and provided many firsts. Among those milestones, it was the first time all four Turtles meet Usagi together, and it was the first time that their mystical visit to Japan is properly explained. Crossover aside, this was a fairly important piece of Usagi’s continuing storyline at the time, connecting the previous series under Fantagraphics to the current one under Mirage. Lastly, we get Namazu. Which is a wonderful story, written and drawn by Stan Sakai and colored by his longtime cohort on Groo: The Wander, Tom Luth. I’ve reviewed Namazu twice already, so you can read my original review HERE and my slightly snarkier review the unnecessary third printing HERE. The collection closes, as they often do, with a cover gallery and some random artwork. Sandwiched between the cover gallery and the last story is 25 pages of Stan’s process for creating Namazu. It’s interesting to see, or it was when it was printed a few months ago, bringing us full circle to being unsure of the timing of this collection. I would have been happier if they had waited for one more story to happen, filling those 25 pages with that instead of process notes. It would have meant waiting, but it would also have made this collection feel more relevant and the last Namazu printing feel a little less (but only a very little less) irrelevant. Plus with both sets of characters still happily in print, there is sure to be another crossover eventually (I’d almost wager in 2019 for their joint 35 anniversary, which would also have made for better timing for this) making this complete collection less complete. I love everything in this book, but in this case, it is nowhere near the sum of its parts and I can only give a disappointed 3 out of 5 stars. Usagi Yojimbo is currently published by Dark Horse Comics who are online or on Facebook and has his own website as well.